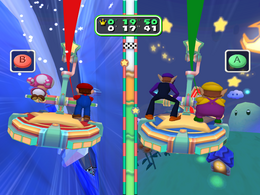 Gondola Glide is a 2-vs-2 minigame featured in Mario Party 6. There are only aesthetic changes between day and night. At night, the moon and stars appear in the sky. 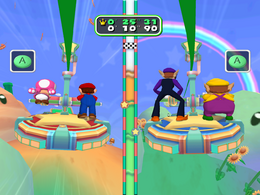 The players glide forward, advancing through the first gate right as the game starts. Both teams attempt to repeatedly press the button that is showed on the screen to move their gondola faster. If the team goes through a star that is a different color, the button changes to another button. The team then has to repeatedly press the newly assigned button. The game only alternates between pressing and . As stated above, pressing the correct button causes the gondola to move faster; pressing the incorrect button slows it down. The first team to reach the goal is the winner. The winning team's gondola pulls to a stop at the top of a snowy hill. They then perform their victory animations from there. Rules – "Press the button displayed on the gates repeatedly to move your gondola forward. The first team to reach the goal wins!" Advice – "You'll hit the brakes if you press any button other than the one shown on the last gate." This page was last edited on December 5, 2017, at 00:38.